Students engage with 8 resources (readings, interactives, videos, modeling activities) to investigate the cycling of carbon dioxide among the hydrosphere, atmosphere, geosphere, and biosphere. Through a series of learning experiences, students view short video clips, graph, model, and analyze CO2 data, and work with several interactive modeling online resources. How do imbalances in the carbon cycle affect global climate? Describe the cycling of carbon through the geosphere, atmosphere, hydrosphere, and biosphere. Describe the relationship between the amount of CO2 in the atmosphere and global temperatures over time. 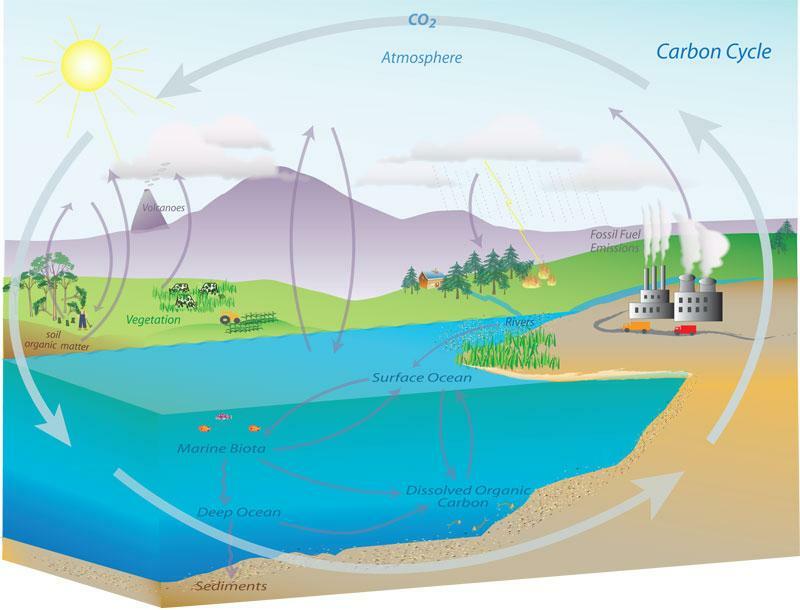 Construct a model of different carbon pathways within the carbon cycle. The resources in this Earth Science Investigation are linked together to form a coherent learning sequence using a four-step process. In this phase of the investigation students identify and discuss the issue or problem and begin to gather background information. In this step of the investigation, use a static visualization students analyze long-term climate date to examine the relationship between CO2 concentration and global temperature change over different temporal time scales. They then read an article that introduces them to the nature of greenhouse gases, carbon sinks and sources, and elements of the carbon cycle to prepare them for the Carbon Cycle game. In the Carbon Cycle game, students travel through the carbon cycle and attempt to get to all the places that carbon is stored in the interactive map. In this step of the unit students develop their approach to answering the question developed in the first step of the investigation. Students use visual cues from NASA maps to explore the yearly cycle of CO2 fluctuations in the North and South Hemispheres and then play the Poker Chip game to explore carbon pools and fluxes with an interactive modeling resource. In this step, students conduct their own investigation and prepare to communicate ideas. Students watch two videos the examine the correlations between CO2 concentrations and global temperatures at different time scales and how changes in Earth's orbit can affect our climate over time. Then they use a visualization to find and quantify the changes in climate in their state/region compared to other locations on Earth. Students watch two videos the examine the correlations between CO2 concentrations and global temperatures at different time scales and how changes in Earth's orbit can affect our climate over time. Then they use an interactive to find find and quantify the changes in climate in their state compared to other locations on Earth. In the final step of the investigation, students do a final project and communicate their results using interactive models to construct experiments and generate data. In this investigation, students do a summative performance assessment to communicate their results and conclusions using interactive and physical models to illustrate the cycling of carbon in Earth systems. They use an interactive visualization to produce a single carbon pathway and then combine their results on a large poster in their classroom to construct a visual model of the carbon cycle. 3 - 5 hours (or four to seven 45-minute periods) of class time to complete all the activities listed in this investigation. Teachers may want to choose a subset of the activities listed here, or substitute one they deem more appropriate at any point. The sequence can be done in 3 hours or less if a proportion of the activities, particularly readings and short videos, are assigned as homework instead of done in class. The standards listed below are composed of three distinct and equally important dimensions of science learning. These dimensions combine to form each standard, and each dimension works with the other two to help students build a cohesive understanding of science over time. This three-dimensional learning system is designed to provide a research-based, up to date set of science standards designed to give educators the flexibility to design classroom learning experiences that stimulate students' interest in science and help them become science literate and informed citizens. By engaging with multiple learning experiences that use all three dimensions over time, students move toward mastery of the target performance expectations listed below. NOTE: The lessons and activities in this Earth Science Investigation are just one step in reaching the performance expectations listed below. HS-ESS2-6 Develop a quantitative model to describe the cycling of carbon among the hydrosphere, atmosphere, geosphere, and biosphere. HS-LS2-4 Use a mathematical representation to support claims for the cycling of matter and flow of organisms in an ecosystem. David Archer's University of Chicago lectures on The Carbon Cycle Dr. Archer is an expert on the Carbon Cycle. Under VIDEOS, click on Class Lectures. The lecture for chapter 8 - The Lungs of the Carbon Cycle - is especially relevant and interesting.